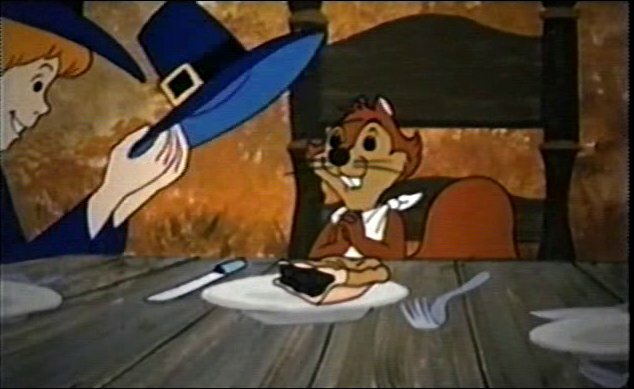 This 1972 Hanna-Barbera animated special centered around the story of the first Thanksgiving between the Pilgrims and the Native Americans. This being a Hanna-Barbera special, of course, a talking animal of some sort is involved. Here, it’s one Jeremy Squirrel, who gets involved when a child from each group goes missing. This special also has a few songs, all unique ones. (Contrast to the Hanna-Barbera Christmas specials, featuring heavily recycled songs.) The incidental music, of course, is standard issue Hanna-Barbera. Some of it dates from as far back as a decade before this special. None of the characters seen here ever appeared in another Hanna-Barbera production. Granted, they never made a heavy number of cartoons taking place in 17th century New England. The Native American characters here aren’t treated in the stereotypical manner seen in most animation made before the 70s. Cartoon Network aired this special in the 2000s for a time, but not since. Boomerang still airs the special during November, however. “The Thanksgiving That Almost Wasn’t” is available, oddly, as a bonus feature on the DVD for the late 70s Hanna-Barbera special “Casper’s Halloween Special.” No, I don’t know why Warner Archive thought releasing these two specials on one DVD was a logical choice.